"Agency means structured freedom to explore and discover with the educator as the facilitator." "Technology does not take the place of what goes on in the classroom and the connection between the teacher and the student." The digital revolution has transformed almost every aspect of society. No facet of this revolution has more potential than its ability to change the way people learn. The availability of a vast array of knowledge and resources at the click of a mouse or the touch of a screen, together with the ability to connect instantaneously with peers and mentors across the street and across the globe, make possible completely new learning environments and experiences. These opportunities are highly engaging and collaborative, and they are based on learners’ own interests and strengths. Students can truly learn any time, any place and at any pace. However, our traditional system of education is rooted in a model first developed in the Industrial Age. It assumes that knowledge is transferred from an external source—teachers, books and schools—to a student. Students are grouped by age, and progress is often based on the amount of time they spend in class and not on how much they have learned. In most instances, any learning that takes place outside class does not count for credit, nor is it even formally recognized. This long-held model is struggling to engage a new generation of students for whom learning is happening all the time—online, off-line, in classrooms, as well as after school, in libraries and at museums. The connected learner can access tutorials, lessons and entire courses online while participating in afterschool programs such as code academies and maker labs. To maximize these learning opportunities, young people must be fully connected. Students need to connect easily with others who can support their learning and to have the ability to share their ideas widely and safely. They need access to broadband, devices and software as well as to high-quality content and the literacy skills to support their full participation. They need to prepare for the world of bits, networks and entrepreneurship. Our digital environments—social networks, mobile apps, online games and participatory websites—also require trust. Trust in the information, in the relationship between student and teacher, and in the medium itself. And learners need the skills to understand and respond appropriately to the risks they may encounter on the Internet. It is time for a new vision of learning—one that includes but is not limited to formal schooling—that captures the transformation the Internet presents. And it is time for a roadmap toward achieving that vision for all young people, particularly those who have been least well-served. If we don’t align these transformations, too many of our youth will lack the skills for modern jobs, and our individual and national economies will suffer. This new vision, then, is the charge of the Aspen Institute Task Force on Learning and the Internet. Our goals, and the goals of this report, are to begin to describe the potential of this new learning environment, to set a vision and framework for lifelong learning, and to identify barriers for making this vision a reality. And, not least of all, our goal is to recommend actions to overcome the barriers separating students, parents and teachers from this vision. This report is our call to action. The vision we describe is bold and urgently needed. It is achievable. And it is absolutely essential if all young people are to be equipped for lifelong success and if we as a society are to realize the transformative potential of the Internet. As adults, we know firsthand how much information is shared on a daily basis by emails, text messages, images or shared website links. At one time this seemed overwhelming, but over time people mastered a new set of skills to take advantage of and leverage these new technologies. At the same time, young people are adopting these new tools more rapidly. They are sending two orders of magnitude more text messages than adults, dwarfing even our email inboxes in volume. In a 2011 book, A New Culture of Learning, Douglas Thomas and John Seely Brown (a member of the Aspen Institute Task Force) described the kind of learning necessary in this new environment as “whitewater learning”1—the ability to acquire useful knowledge and skills while at the same time practicing them in an environment that is constantly evolving and presenting new challenges. They argue that our learning environments need to match the speed and degree of change happening in the world around us. Rather than systematically accumulating static “stocks” of knowledge, students now need to learn how to actively participate in “flows” of knowledge by engaging with others in the construction of new knowledge. This kind of knowledge is often put to use at the same time it is learned. It is most effectively acquired through solving problems with others in an environment that offers an abundance of challenges and unlimited opportunities. In this new world, curiosity and creativity become critical skills (or dispositions) that motivate students to seek answers to the questions that most interest them—an ability that will serve them well throughout the rest of their lives. The Creation of New Knowledge. The shift from mass, mainly one-way, media that are consumed to interactive media that encourage participation and activity, and the recent rise of social media that actively encourage participation, mean that individuals are evolving from passive consumers of content to active creators and contributors. The Internet offers access to an array of digital resources that provide the means for creating and sharing content with others. This can be as simple as exchanging text messages with a friend or updating a Facebook page, or as elaborate as producing a video for YouTube, coding for a new game or publishing a personal blog. Online interactive games are based on mastering increasingly difficult levels of challenges, accomplishments that often require planning and collaboration with others. One of the characteristics of the new media is that they blur the lines between once-distinct categories of information. Media such as these are often seen merely as social tools or sources of entertainment. But they can also provide the means for valuable educational experiences if they are used to pursue a personal interest or to learn something new. These tools allow students to collaborate with one another on lessons, projects and other learning activities. Technology is also helpful for remote, rural or low-income learners with little or no access to advanced educational opportunities at any age. Students can have access to Advanced Placement courses never before offered, learn necessary languages and tools for tomorrow’s economy and gain more access to the creative economy. Learners who are first learning the English language or are their family’s first high school or college graduates will now have low-cost opportunities that were not afforded to previous generations. Learning in this new environment is not a solitary activity but frequently involves participating in learning communities, sharing the process of discovery with others with common interests. The most powerful types of learning involve not just acquiring knowledge but also collaborating with others to solve problems or create new knowledge. And in education, it offers opportunities not just for students but also for teachers who can participate in online communities around the subjects they teach, crowdsource new lessons plans, or create and share new content. Agency. Increasingly technology is helping students chart their own unique pathways of learning subjects as well as adjusting the pace of their learning. To take advantage of these new environments, learners must move from the passive absorption of content to a new sense of agency that enables them to find a path that makes sense for their individual interests and learning styles. Educators and mentors need to guide and support them in that quest. Agency is highly motivating for students. But the Task Force recognizes that not all learners are able to exercise the same level of agency. Some young people have the background, the family support and the “questing disposition” that equip them to be confident independent learners, while others, many with fewer advantages, are less prepared to orchestrate their own learning experiences. In addition, students of different ages will be at different cognitive stages that will determine the extent to which they can operate on their own. These differences need to be recognized and taken into account if the benefits of new learning opportunities are to be truly inclusive. In some cases, self-motivated young people will be able to pursue their interests on their own, effectively mobilizing online and off-line resources to further their personal learning goals. In other cases, learners will need to be supported by schools and other community institutions that recognize the power of this kind of learning and are willing to integrate them into their existing activities. Today, stories abound of students once disengaged from the education system who are now re-engaging and thriving. They found opportunities to explore their interests while learning subjects such as the arts or coding. The skills and knowledge they have gained have then allowed them to succeed in the intellectual economy. It will be important for learning institutions and professionals to consider how individualized learning can apply to all communities, fostering equity in educational outcomes rather than exacerbating divides. In addition to empowering young people to learn, helping them to develop a strong sense of agency may be the most effective means of keeping them safe online as they follow their interests. Learning Networks. Learning that is active, engaged and personalized does not take place in a cloistered environment. Rather, it is made possible by a web of environments that includes libraries, museums, schools, afterschool programs and homes. Online resources that can support learning include tools such as search engines, blogs, wikis, podcasts, videos, social networks, massive open online courses (MOOCs), open educational resources and specialized communities of practice. Broadband connections, both wired and wireless, along with a variety of access devices ranging from desktop computers to smartphones, provide the “on-ramps” that make these resources widely available. And, of course, people continue to play critical roles, both online and off-line, in inspiring, guiding and protecting students’ learning. Teachers and parents have vital roles in ensuring that each new generation of students gets the education that they need, safely and securely, even as peer-to-peer connections are enabling new forms of social learning. 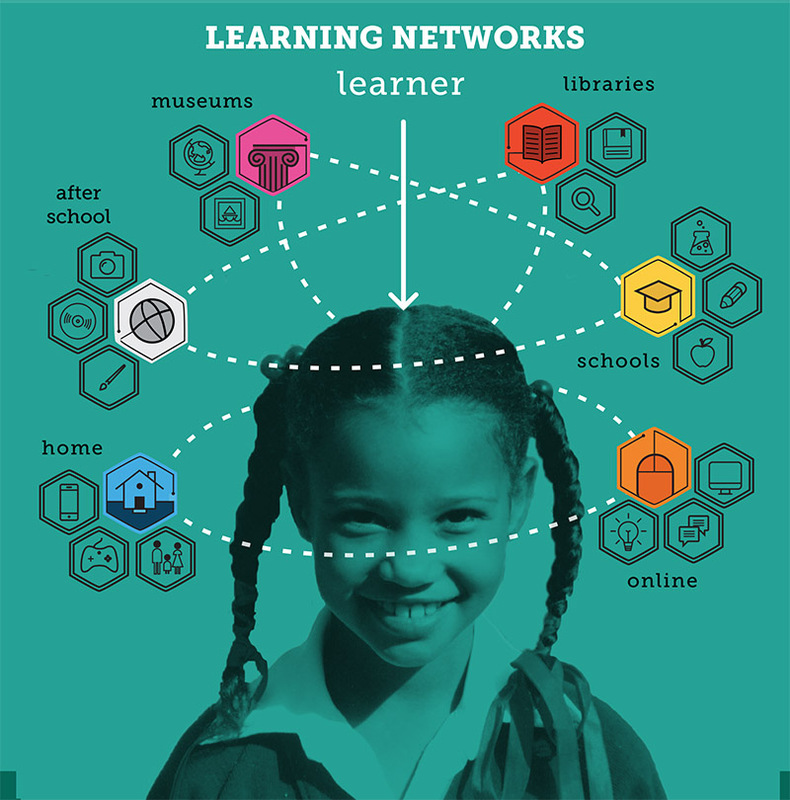 Learning networks not only provide access to a virtually endless array of learning opportunities, but they can offer learners multiple points of entry—both inside the classroom and beyond it—that provide highly individualized pathways toward career, civic and academic success. They can support acquiring traditional content and skills and also inspire students to be creative, thoughtful problem solvers. Learning networks facilitate student learning through the pursuit of their own interests, at any time and at any place. They also represent a powerful new means for individualizing instruction within existing educational institutions. The current reality is that many learner networks are fragmented, organized within silos and not interconnected. Our education system is organized primarily around the learning that occurs within a school and does not capture or recognize the learning that takes place outside of school. New learning networks connect it all. Peer-Supported In their everyday exchanges with peers and friends, young people are contributing, sharing and giving feedback in inclusive social experiences that are fluid and highly engaging. Interest-Powered When a subject is personally interesting and relevant, learners achieve much higher-order learning outcomes. Learners flourish and realize their potential when they can connect their oriented interests and social engagement to academic studies, civic engagement and career opportunity. Production-Centered Digital tools provide opportunities for producing and creating a wide variety of media, knowledge and cultural content in experimental and active ways. Shared Purpose Social media and web-based communities provide unprecedented opportunities for crossgenerational and crosscultural learning and connection to unfold and thrive around common goals and interests. Online platforms and digital tools can make learning resources abundant, accessible and visible across all learner settings. [B]reaking learning (and education overall) out of traditional institutional environments and embedding it in everyday settings and interactions, distributed across a wide set of platforms and tools, which include a rapidly growing and openly [licensed] content commons (Wikipedia is just one example), on-demand expertise and help (from Mac Forums to Fluther, Instructables and WikiHow), mobile devices that take information into the physical world and makes it available any place any time, [and] new work and social spaces (TechShop, meetups, hackathons, community labs) that are evolving as important learning spaces3. Technology continues to evolve and become more powerful, adding new capabilities to support learning. Network connectivity is increasingly ubiquitous. New types of hardware are integrating computing and communications capabilities in innovative ways. Computing in the cloud makes it possible to provide supercomputing power to even simple devices. And the technologies of artificial intelligence, machine learning and natural language processing are creating new forms of “cognitive computing” that can act as intelligent guides for students and more rapidly analyze student work4. The key to this transformation is that the learner is at the center of the process, supported by peers, mentors, parents and educators, using networks that go beyond the traditional schools to support their learning. And because it is digitally based, all learning can be captured and credited, no matter when or where it occurs. As a byproduct, the wealth of data that is generated on student learning can also be used productively by educators and students to customize programs for individual learning. This new learning ecosystem, then, represents a significant shift from traditional conceptions of how education is organized and delivered. The goal is to empower learners and educators to achieve more. This is necessary to encourage lifelong learning, to foster the skills and dispositions necessary for the 21st-century workplace, to instill innovative thinking and to enhance citizens’ ability to engage in civic affairs. Connected learning takes place online and off-line, within schools and beyond. It occurs when “a young person is able to pursue a personal interest or passion with the support of friends and caring adults, and is in turn able to link this learning and interest to academic achievement, career success or civic engagement.”8 Thus, connected learning implies that learners are able to find the resources they need and connect with peers, mentors and institutions that can advance their learning. The Aspen Task Force has drawn from the connected learning framework in its research and deliberations. The Task Force understands that change is often difficult. The approach to learning envisioned in this report raises numerous issues that need to be addressed. But the Task Force believes that the potential of the new networked environment for learning deserves broad support because of the opportunity it presents to accelerate and enhance learning for everyone. It can enable our education systems to become what our economy needs, our society demands, and our students deserve: the transformation of an individual’s learning environment to a broader learning ecosystem. This ship has sailed—the world is moving on and technology is part of it. We do not want to leave the school system behind. We need to keep driving toward where we want everyone to be versus waiting until everyone is ready. The end goal will involve the Internet, and there needs to be a framework for it. America’s vibrant entrepreneurial culture has demonstrated the power of innovation to bring benefits to the public and drive economic growth. And activists working in the public interest have been responsible for valuable social innovations. This same spirit of innovation can also be a source of positive change in learning. Technology can be isolating and can hinder a child’s social, emotional and physical development. Not every child will thrive with self-directed learning. The growing use of technology for learning may increase the opportunity and achievement gaps between well-off and disadvantaged students. Adults worry that young people are less safe online and that technology poses potential threats to a child’s privacy and safety. Parents and teachers who are unfamiliar with new technology are not well equipped to support its use by young people. A significant percentage of children have limited or no access at home to computers or smart devices; this hinders their opportunities to participate in these new forms of learning. It is difficult to assess the quality of online educational materials. Teachers and educators are already overwhelmed with demands and are not prepared to handle the additional challenge of new technology. The integration of technology in schools will cause disruption, and there is no guarantee it will improve education. Schools rely too much on “seat time” and not enough on actual learning. Technology will take away resources from traditional education. Beyond digital media, students still like interacting with educators and learning from books—they want it all. School district leaders fear that alternative learning options and technology will result in reduced funding for schools and districts. These fears and concerns are real. But they are not insurmountable. We have spent over a year exploring these issues and seeking to identify the most promising options for reconciling the opportunities and potential hazards. The emerging learning ecosystem holds great promise for today’s generation of learners. The Task Force sees this new culture of learning as a way forward for the country at every level—supporting individual empowerment, economic development, increased qualifications for jobs, social advancement, improved civic governance and even increased global competitiveness. But much remains to be done to make these opportunities a reality while still addressing the legitimate concerns voiced above. We make recommendations for actions that will truly put learners at the center of the networks that can enhance and accelerate their learning. Teachers need support to help them integrate new methods of learning into the classroom. Community organizations, including libraries, museums and other civic and cultural institutions, must become full-fledged participants in learning networks. Parents continue to have an important role to play as enablers of and guides for their children’s learning experiences. We recommend steps that are needed to ensure equity of access to the resources that young people need to pursue their learning goals. This includes having adequate connectivity, including reliable broadband connections, as well as access to the hardware, applications and high-quality content and courses necessary to support their learning. When we say “everyone,” we mean everyone. We believe that learning networks need to be maximally interoperable to ensure that learning assets are not isolated in separate silos and that innovations can be shared across networks. Interoperability is also important to allow students to move freely across networks to pursue their learning objectives and to receive credit for all learning accomplishments wherever they occur. Interoperability also empowers educators and parents to have flexibility and control regardless of which providers they choose. We also believe that all learners and educators need a sufficient degree of media, digital and social-emotional literacies to learn through multiple media confidently, effectively and safely. Every student must have a chance to learn these vital skills. We focus on steps needed to create a trusted environment that will protect children’s safety and privacy online without compromising their ability to learn. Parents should be able to trust that their children’s personally identifiable information is safe, secure and won’t be used in ways other than to help their academic progress. We argue for a shift from a negative, fear-based approach that attempts to insulate children from all harm but may also create barriers to valuable resources to a proactive approach that will enable students to pursue online learning experiences safely. Read "Learner at the Center of a Networked World"
What is the Task Force?